Rolfe - Memison or Mason? The Rolfe mystery gains two new data points. D.D. Degg, in a reply to yesterday's post, points us to an original rough for Brenda Breeze that is quite clearly signed Rolfe Mason. On the other hand, I found this article in the October 21 1939 issue of E&P, where they give a pretty convincing bio of Rolfe Memison. Now being the provincial cuss I am, I know practically nothing about Brit cartooning. Might any of our readers from across the pond be able to tell us if there really was a Rolfe Memison who did a lot of cartooning for plenty of big name publications? And might it be that Memison really was the originator, and later someone named Mason took over the strip, and kept creative continuity by signing himself as Rolfe Mason? Or did Memison simply have a signature that looked like 'Mason'? A new Sunday comic, "Brenda Breeze," a half-page in pantomime by Rolfe Memison, Continental humorous artist, will make its Amer­ican newspaper debut Oct. 22 through NEA service, it was announced this week. Submitted to NEA "several months ago," when the service was shopping around for a new type of girl comic, according to Fred S. Ferguson, NEA president, the feature has been signed up under "a long term contract." 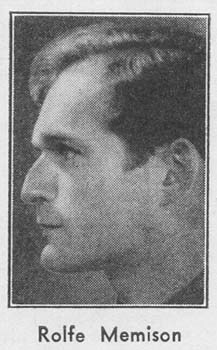 This marks Memison's first appearance in U. S. newspapers. Memison, or "Rolfe," as he signs his work, is a young English artist who came to the U. S. to live a little more than a year ago. He has been free­lancing since, his work appearing in the country's leading slick paper mag­azines. An expert on pantomime, his favorite medium of expression, he uses it exclusively in his new comic. "Brenda Breeze" never says a word. Prior to 1936, Rolfe was "a serious artist," a painter of portraits and land­scapes. One of his paintings was ac­cepted by the Royal Academy in Lon­don last year. He might have been painting landscapes and portraits in Spain today if the Spanish Revolution had not come along and chased him back to England and into a comic art career. The English chuckled over his car­toons and humorous illustrations in such publications as Bystander, Pass­ing Show, London Mirror, London News Chronicle, Sporting and Dram­atic News, Answers. His work also ap­peared in other European publications. Born in England in 1906, Rolfe came to America for the first time in 1923, and it was here that he received his first artistic encouragement. He cop­ied a Rembrandt at the Metropolitan Museum of Art, New York, taking two days from his job of packing radio receivers, and the reproduction sold for $5. It determined him on an art career. "Last summer I returned to the U. S. to make this my permanent home, and settled in a studio on top of a midget Gotham skyscraper (six floors). It contains a drawing table, easels, Spanish pictures, bullfight posters, two guitars, a black cat and a blond girl with blue eyes named Barbara. "She's an Indiana girl, reared in Florida. We were married last year, and she has become a whiz at cooking 'Paella Valenciana' and bouillabaisse, and posing in a Spanish shawl." I was a good friend of this wonderful man...loved him very much..so glad to see his work posted and he get some credit . You just never know where you're going to learn something interesting. This ad from the October 21 1939 edition of Editor & Publisher trumpets the addition of Brenda Breeze to the NEA syndicate lineup. The strip was not of any great consequence and is hardly remembered today, but it had a long prosperous run of 23 years. But that's not the interesting part. What interested me was that the strip was signed just "Rolfe" for all those years, and I never found any further information about the creator except for a quick mention in Ron Goulart's The Funnies, wherein we are told that the creator's name was Rolfe Mason. I took that as mystery solved and dutifully logged the name in Stripper's Guide. Now along comes this ad, about the only advertising NEA ever bothered to do for the strip, and we learn in the fine print at the bottom that 'Rolfe' is actually Rolfe Memison, so called "internationally known artist and humorist". Okay, so it's not exactly solving the riddle of the Sphinx, but I'm always gratified to find a nugget of knowledge tucked away in an unexpected place. And Rolfe Memison, internationally known artist and humorist, you can rest easy knowing that your rightful fame is restored, and no longer someone named Rolfe Mason getting credit for 23 years worth of pretty gals and pantomime yoks in the Sunday funnies. Enough with the obscurities for a little while, let's get back into some news of yore. Here's a nice article on Billy DeBeck from a 1939 issue of Editor & Publisher. DeBeck would be dead just three years after this article was published. On October 6, 1919, King Features Syndicate brought Billy De Beck, then a cartoonist for the newly merged Chicago Herald & Examiner, to New York, gave him a contract and told him to start a new comic strip. Thus was born "Barney Google," one of the most famous comic strip characters in America, and the character's pet in his various escapades, the immortal race horse, "Spark Plug," which in cash earnings outran Cavalcade, Gallant Fox, War Admiral, Sea Biscuit, or any other real horse in racing history. This week Billy De Beck and Barney Google observed two decades of service with KFS. Barney is still around, but Spark Plug has gone into "retirement." His place, for a time, was taken by a small edition called "Pony Boy," but Billy didn't think it caught on with the public, so he discontinued it. Follows some of the unique distinctions which Barney and his pal Spark Plug have acquired: in addition to the record-breaking syndicate receipts a toy company sold a million dollars worth of Barney Google and Spark Plug toys and dolls, three Barney Google musical shows toured the country for two years and the Barney Google song sold over a million copies and brought royalties of some $25,000. Billy (his name is William Morgan De Beck) is "Barney Google." He has had a colorful career, exciting and extravagant. Uninhibited, full of the zest for life, he burst into the spotlight in his twenties and experienced just such hilarious adventures as Barney Google goes through, and lifted himself into riches and celebrity. Now 49, he has settled down. And, of course, so has Barney. Where once the strip was pure slap-stick, it now attempts to portray character and, where Barney Google used to be a hell-raiser, he now is more the motivator and observer, leaving the rough stuff to others. In Billy's current hill-billy series, one of his funniest continuities to date, which was bom about five years ago, he has created a bright galaxy of new characters - "Snuffy" and "Lowizie Smith," the hilariously funny mountaineers, "Snuffy's" nephew "Weasel-puss," "Sut Tattersall" and others. Ever since the early days of his Google strip, Billy has been introducing phrases and words which have become the national rage and part of our every day speech: "The heebie-jeebies," "Horse Feathers," "So he took the $50,000," "oskie-wowow," "I hope you won't feet hurt," and "sweet mamma," to mention only a few. Currently Barney is in the Smoky Mountains adventuring with his hillbilly friends. Immensely popularizing the strip today are the "Feather Merchants," hill-billy midgets, if you can call them that, the zaniest looking group of impossibles imaginable. In the hill-billy series, Billy is popularizing a new vocabulary-"Jeepers Creepers," "Bus' Mah Britches! ", "Time's a wastin," "Discombooberate," "I swow," and others. Some of these words and phrases are authentic, Billy told the column. He gets them from his extensive hill-billy library of more than 300 books which he has collected all over the country. Some of the words are his own invention. Billy, his friends say, is one of the fastest artists in the business. Almost every other comic artist first makes a hard and fast pencil outline, then goes over it carefully in ink. De Beck uses the pencil just to suggest position and action and then draws directly in ink. He has never been able to systematize himself. For days he won't draw a stroke and then he'll have a siege from ten in the morning until two at night in which he'll complete two weeks of dailies and his Sunday feature. He said he draws seven weeks ahead on his Sunday page and three weeks ahead on his daily strip. He leaves his business affairs exclusively to his wife and has only the vaguest idea about his money or investments. He dislikes to discuss politics and is little concerned with world affairs and never reads anything that would make him think too much. Aside from his work, the cartoonist is interested primarily in golf, swimming and bridge. His favorite author is Sinclair Lewis, and his highest ambition, he says, is to be an acrobat. He was bom in Chicago, April 15, 1890 and attended schools there. His first job was with a Chicago theatrical weekly, Show World. From there he went to the Youngstown (0h.) Telegram and, in 1912, he moved on to the old Pittsburgh Gazette-Times as editorial cartoonist at $200 a month. 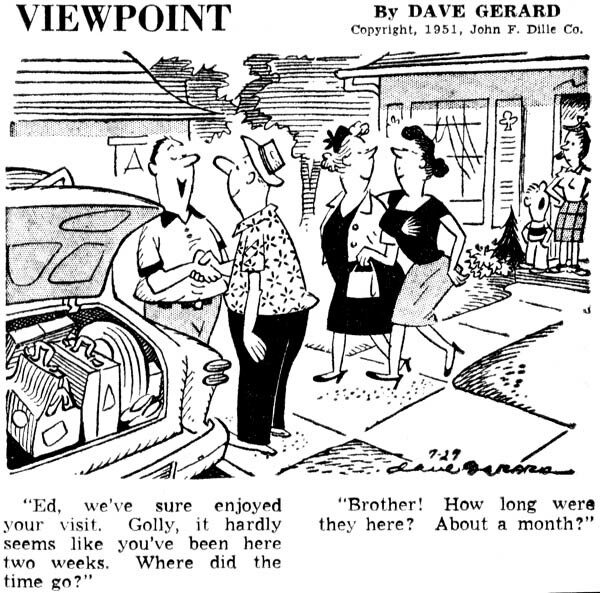 For the Chicago Herald he drew "Married Life" - a daily two-column panel and full page on Sunday and a Sunday comic page called "Haphazard Helen." [if he did any work on Haphazard Helen, he never signed it - Allan] From there he went with KFS. Today the De Becks live in a big twelve-room house in St. Petersburg, Fla., the year around. They have no children. Now on a visit to New York, they will return to Florida at the end of this month. I've read that DeBeck happily handed over the strip to his ghost early on. Any idea when he stopped having an active hand in Google? Glad to see this bio bit-- I LOVE barney google (and Bunky, ever since reading the run in nemo magazine years back). DeBeck was one of the best in an era of outstanding talent. My impression is that DeBeck was firmly in control of Barney until his last days. Certainly he used assistants on the art, but DeBeck's hand is plain in the stories. I think Barney Google is an unfortunately neglected classic; its reputation hurt by the addition of the Snuffy Smith hillbilly character, many strip fans tend to ignore it, never having read the fabulous material of the 1920s. I can't stand Snuffy Smith (with apologies to Uncle Fred Lasswell), but Barney and Spark Plug were great characters, vividly written and beautifully drawn. One of the problems of relying on obscurities for many of my daily posts is that in a lot of cases there's darn good reason the feature is obscure. And I take no joy in saying bad things about these features -- I wish I could call them all neglected classics and undiscovered gems. But take Craig Leggett's Zoonies, for example. Here's a strip that mines the anthopomorphic animal genre, a vein that for my money was tapped out by, oh, about 1910 or so. And Zoonies brings absolutely nothing new to the concept, in fact many of the gags don't even take into account that we're dealing with talking animals, a cardinal sin for the genre. Most of the gags are jokebook filler material at best, and the art is professional but does nothing to elevate the strip. You have to wonder what the people at NEA were thinking when they started syndicating this strip (it ran 4/18/77 - 7/12/80). Was the newspaper world really crying out for a clone of Animal Crackers, a strip that is almost indistinguishable from this one? Did the syndicate see something of genius in this strip that completely eludes me? Did the syndicate editor seriously think to himself when he saw this, "Hey, this is bound to be the next Peanuts, by gum!" Now I don't mean to dump on Zoonies or Craig Leggett specifically -- they just happen to be perfect illustrations of a point. So, Craig, buddy, wherever you are, I'm really, really sorry to pick on you. But this strip and many others of similar quality seem to continually issue from the syndicates now just as they always have, as if the editors just couldn't find anything better to put on their roster. And what do syndicate editors always cry about? They bemoan the fact that they get so many submissions, and so many of them are just fabulous, that it is a terribly hard job to pick just a few of them every year. Say what now? Zoonies was your pick over all those great submissions you received? I've seen quite a few rejected syndicate submissions, some of which have blown my socks off. Zoonies makes me want to put a sock over my head. I'm left with one inescapable comclusion. Many syndicate editors are utterly incompetent nincompoops. End of diatribe. And, once again, sorry Craig. Definatly true about the last part. Some time back, there was a comic-strip called "Unfit", which was poorly written and poorly drawn (now, I can tolerate bad drawings, but "Unfit" took the cake). Coincidently, "Unfit" was syndicated by United Features, which is part of the United Media organization, where they have a another syndicate NEA, which distributed "Zoonies"...maybe there's a connection here. Y'know, I can almost forgive a syndicate editor picking up "Mallard Fillmore". 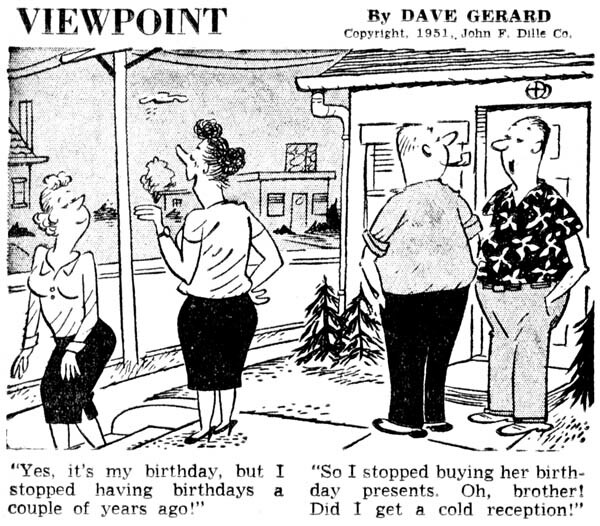 It is undeniably one of the most humorless strips ever, but at least we can see why the editor chose it - there were no other strips available at the time that had a conservative viewpoint on politics and society. Yes, "Mallard Fillmore" is awful, but it does fill a niche that wasn't being served, and was bound to have a receptive audience among newspapers looking for a counterpoint to "Doonesbury"'s liberal viewpoint. Purely on the basis of the almighty dollar, I get "Mallard Fillmore". I imagine the syndicate has found it to be a profitable property since it runs in a pretty healthy number of papers. The same bottom dollar approach would not, however, explain "Zoonies" or "Unfit". 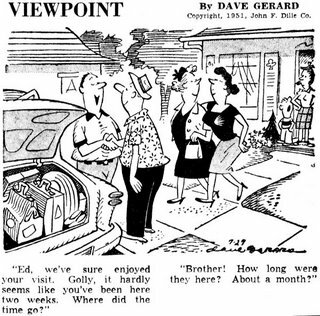 Before Dave Gerard brought his magazine cartoon Will-yum to the daily comics page, he created the panel cartoon Viewpoint. This panel in a way harkened back to the days of top hats and corsets in that it employs a 'he said-she said' narrative, much out of vogue by the 1950s. 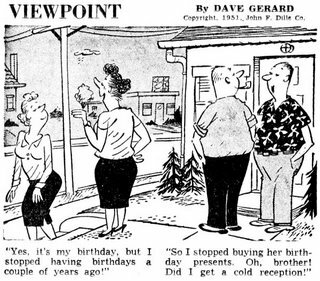 Viewpoint began on January 9 1950 and from the start was viewed by most newspapers as strictly filler material, not worthy of a regular daily spot on the comics page, but used most often to plug a hole elsewhere in the paper. To go along with its caption heavy style, Gerard renamed the feature to the klunky It's All in the Point of View on March 3 1952. This move, hardly a marketing plus, was probably at the insistence of some syndicated newspaper columnist who shared the original title. Either Gerard or the Dille Syndicate came to its senses in 1953, and gave Viewpoint the heave-ho. It was replaced by Gerard's Will-yum, which had some success as a recurring magazine cartoon in The Woman's Home Companion, and ran with decent success for almost fifteen years. in looking at viewpoint I thought I saw the style of a cartoon book I use to have that was about hunting and sports. I specifically remember duck hunting and fishing cartoons in it. The characters were a lot like these in viewpoint. Is there another artist of a similar style? Or was is Gerard? I'm going to take a wild guess that you're thinking of Woody's World by John Holm. Similar style and about hunting and fishing. A reprint book of that was published in 1968. Two obscurities for the price of none today -- two more of the New York Herald-Tribune's Sunday filler strips. These two were executed by cartoonists who chose to by somewhat anonymous. 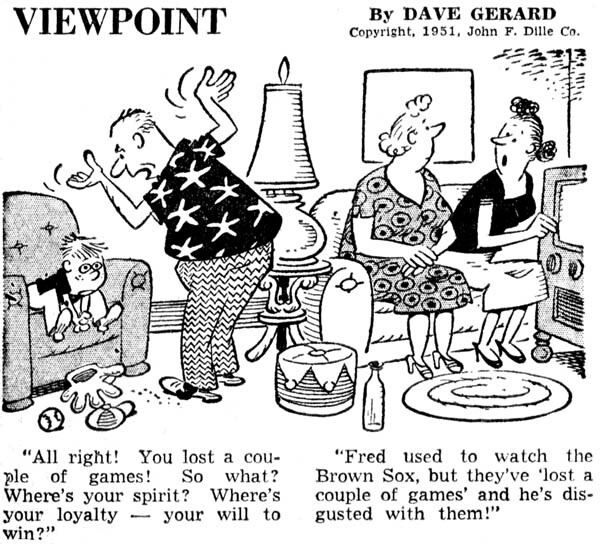 Specs, credited to R. Gustafson, ran 5/12/46 - 5/25/47, not every week of course because it was a filler. This could, I suppose, be Bob Gustafson, but I assume he had his hands full at the time assisting/ghosting Tillie the Toiler for Russ Westover. Shaggy ran intermittently 10/7/45 - 7/11/48. It was credited only to 'Gould'. I think I'm safe in guessing that neither Chester nor Will were involved. Have you compared Shaggy to Gould's later companion strip about a family with a pet crow? He wasn't above using a fast and cartoony style there. Fair 'nuff, Ger, but I can't see ol' Chet moonlighting to the NYHT for the pittance they would have paid for these strips. We first discussed the New York Herald-Tribune filler strips back on this post. These one-tier strips were mostly pretty bad, with a few notable exceptions. Pookie isn't anything particularly special, except that it replaced Mal Eaton's long-running 'regular' Sunday, Peter Piltdown. Peter Piltdown ran in the Herald-Tribune's Sunday comic section for over a decade, and Pookie was a character in that strip. Eaton's full-size strip, though it had a healthy run, was never a syndication success, and that's probably the reason for its demise. Pookie, as a filler strip, wasn't offered for syndication. It ran, space permitting, from 12/22/47 through 2/29/48, in addition to Eaton's new full-sized strip Tizzy, also not a syndication success. Is this really obscure, when Peter Pitdown and Pookie moved over to BOY'S LIFE magazine - the official Boy Scout magazine, as Rocky Stoneaxe (hope i have that right) around 1950 - lasting at least 20 more years? Casting aspersions on my obscurities, eh? I didn't know that the Pookie character continued in Rocky Stoneaxe, but a quick check of the files did bear that out. Of course, the obscurity here was the filler strip, not the character, but thanks for the info on its continuation. Interesting that Eaton had to change the name of his main charcater, but that Pookie was allowed to go on as before.